Recently, we posted about the new Toas-Tite replicas from Replica Products. 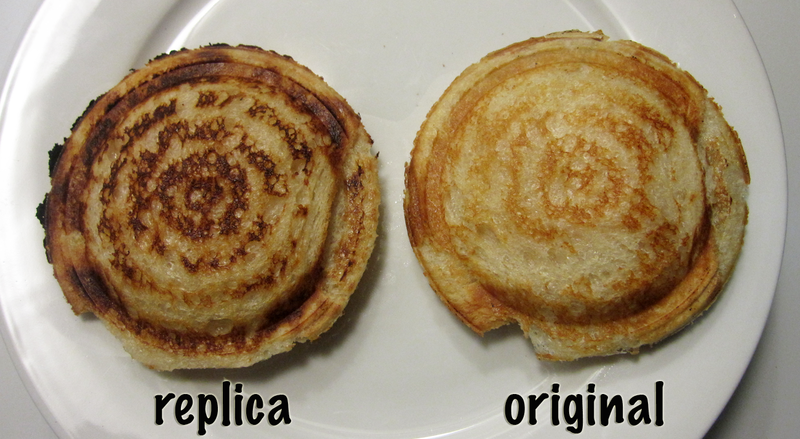 Now it’s time to get to the detailed comparison to the vintage originals. We compared the replica to one of our post-patent original Toas-Tites (rather than the pre-patent, “deluxe”, Boy Scout, or Tid-Bit). Please note that Replica Products did provide us with their replica Toas-Tite in order to write this comparison, but we are not affiliated with their company. 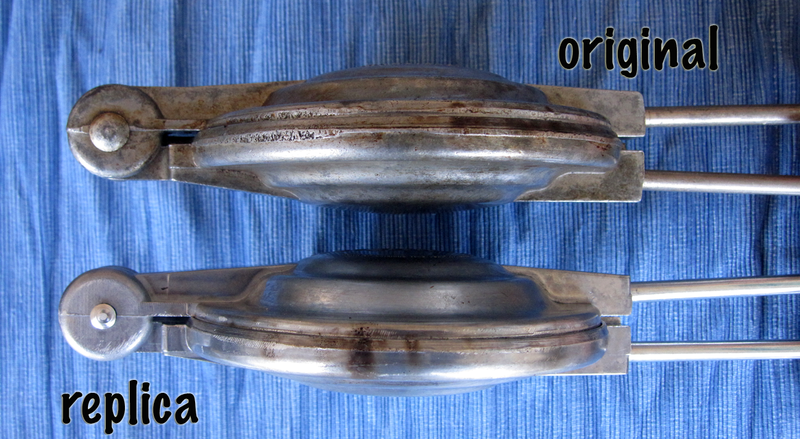 Here’s a top view of both original (post-patent) and the replica. The logo is slightly different as the replica says “Toas-Tite Grill” and the lettering is slightly different. 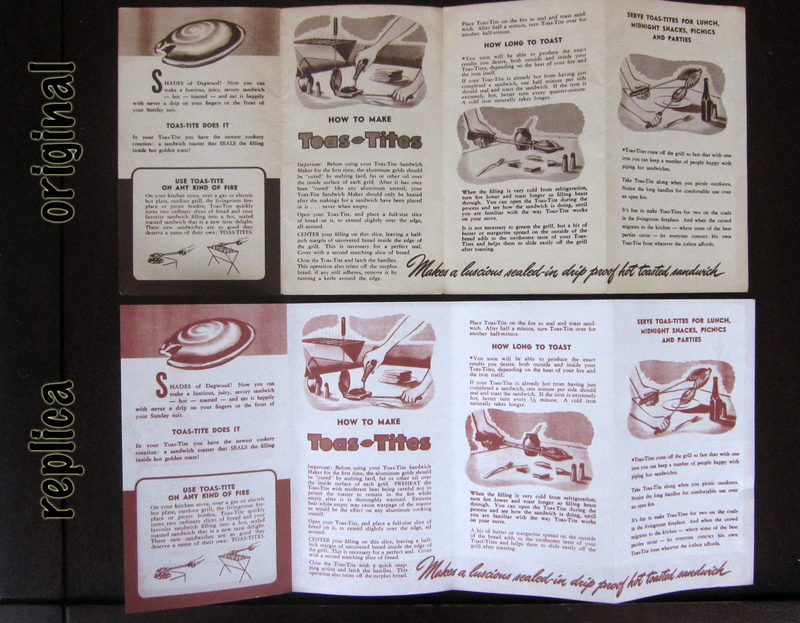 The original also lists the patent number and the replica says “Replica Products – Replica of Original 1949 Toas-Tite Grill”. The interior is nearly identical. 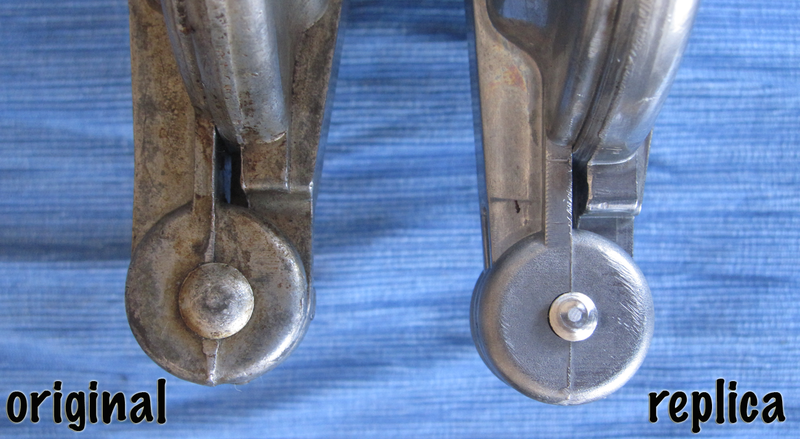 The hinge is also nearly identical, though the original has a larger head on the hinge pin. 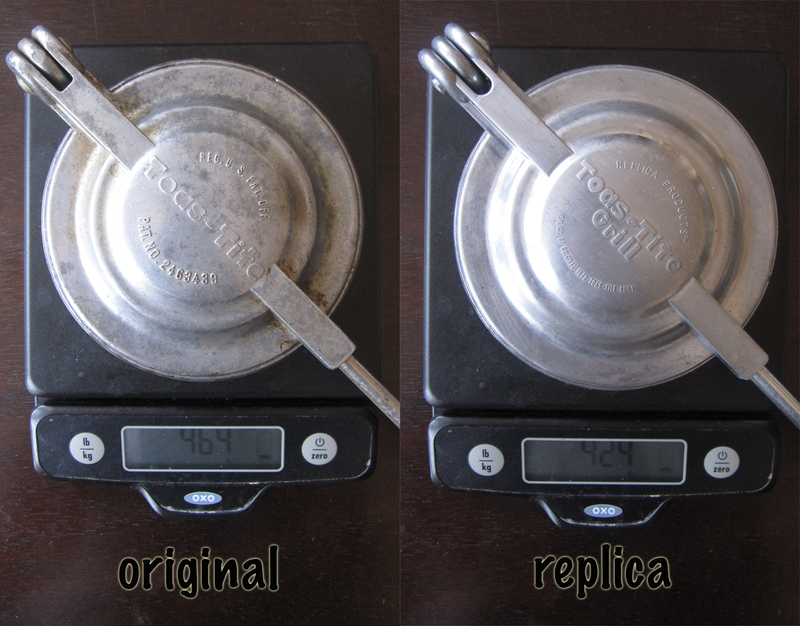 As you can see from our measurements on our food scale, the replica is 40 grams (or 1.4 ounces) lighter than the vintage version, which is noticeable if you’re used to the feel of the vintage models. Our box is actually at Boy’s dad’s house right now, so we didn’t have it to take side by side pictures but hopefully some pictures we took a few months ago will give you an idea of the comparison. 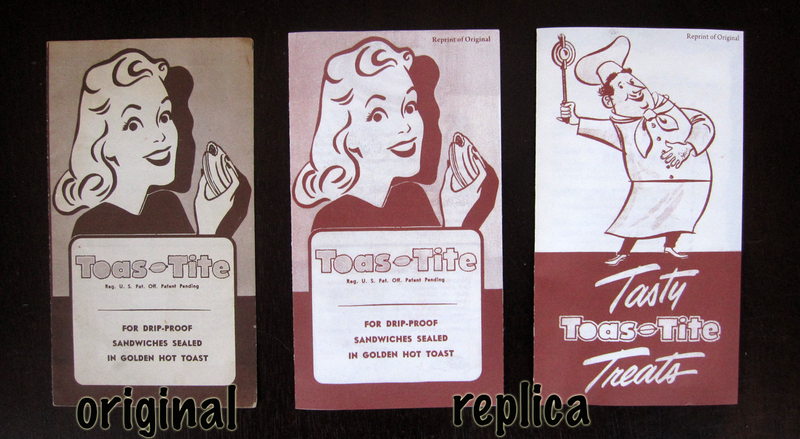 …while the original box we have says “Makes a Luscious Sealed-In Drip Proof Hot Toasted Sandwich”. However, the side of the replica does bare (almost) the same slogan. The original also has a perforated edge around the woman’s head and along the top of the orange. Last but not least, the literature. The replica comes with an instruction sheet on how to season your grill for the first time as well as cooking instructions. It also includes a copy of the original instructions and a copy of the original recipe booklet. Okay, but how does it compare for the cooking? That’s the most important thing! 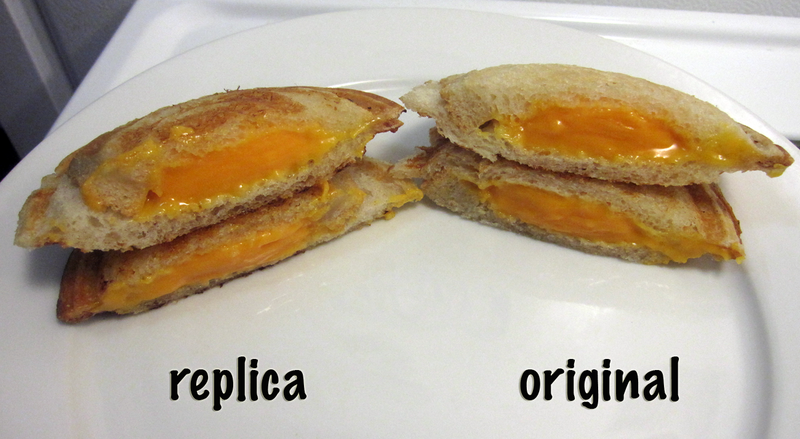 For our test, we went with the most basic Toas-Tite sandwich you can get – grilled cheese. We used 4 identical pieces of white bread, the same weight of butter (measured to the gram), and 2 identical slices of American cheese. We toasted each side for exactly 2 minutes on each side over the same level of flame. 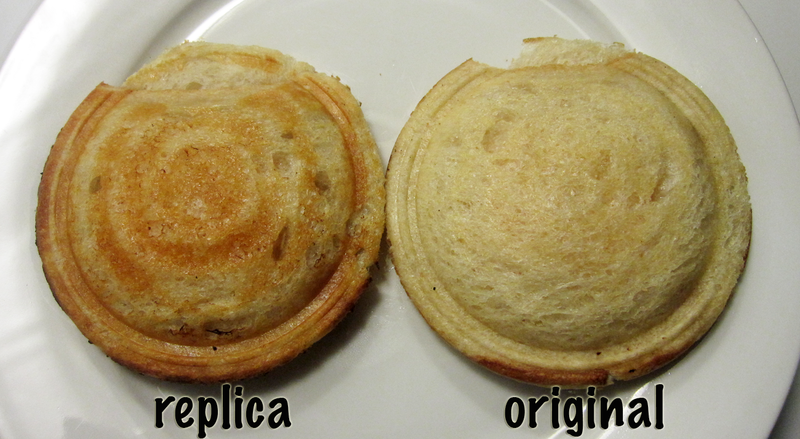 As you can see, the replica sandwich bread is more toasted than the original in the same amount of time, though the cheese was similarly melted. Using a replica does require shifting your cook times so bear that in mind. So whether you have an original Toas-Tite, are looking for one on eBay, or get a replica or a different brand all together (Nut Brown, jaffle, Pie Iron, etc. ), happy toasting! Thanks for this important info. Keep up the good work. Still got mine from email for less. i lost my original one from my childhood, but this one is identical. Although the the replica is almost identical reproduction. Just ordered a new Replica. Will use as a gift to a son who remembers them well, thanks for for research and help. Love your site. Thanks for the detailed review..
Can you use on a ceramic top range? Hi Joann, we haven’t used a ceramic top range before but I have a feeling that it should be a total success. Let us know if it works! The original definitely does a better job. The weight makes a difference. These are campfire devices more than range-top. Fires get much hotter. 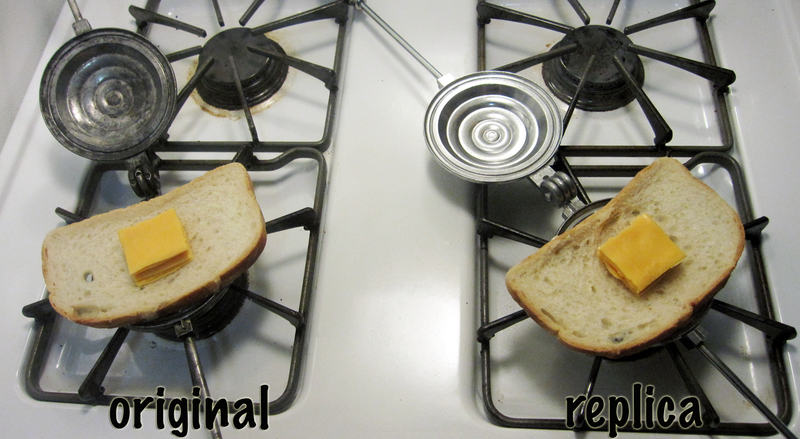 So in a real world scenario, the replica tends to burn the sandwiches faster. Truth be told, Cast iron sandwich makers are a much better alternative to either of these. Rome brand is excellent. Square though instead of round. I have an original toas-tite. I have used it all my life (I am 52). I just made a grilled cheese sandwich for my daughter and I for dinner. It was so good. I have an original Toas Tite that doesn’t have a patent number, it says pending… It’s been in the family for at least 45 years that I know of and my father claims that it was bought by his parents as NIB… Any idea what the date is on it? I’m guessing 40s… Oh yeah, I am about to turn 49, with a 2 yo and another on the way… The kids are growing up with the same “cheese pies” that I had as a kid… Love it! We have one of these. I put beans and cheese on white bread and create an amazing bean and cheese turnover! Delicious sandwich! All I can say is… uummmm gooood! I believe I have an original Toast-tite, is there any value to it? I have one of the original Toas-Tite and I was wanting to find out what it is worth. 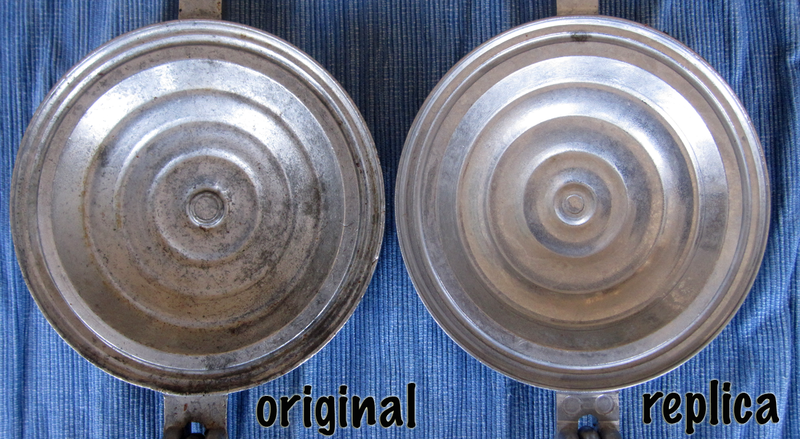 My mom had a flying saucer shaped grill cheese maker I loved to use back in the sixties and seventies. I don’t remember it having a name on it. I remember it being pretty much black from use. It’s gone now and nobody in my family remembers what happened to it. – Must that have been a Toas-Tite? – Where there any competing products at the time that were similar? – Was the original made from aluminum or cast iron?